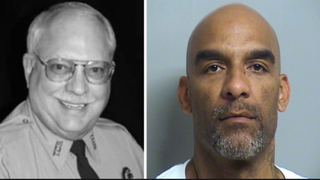 Reserve Deputy Robert Bates, 73, shot and killed Eric Harris in Tulsa, Okla., April 2. The April 2 shooting death of Eric Harris by 73-year-old Tulsa, Okla., Reserve Deputy Robert Bates is more than just the latest tragedy involving a black man’s execution on film. Grisly footage from the body camera of an officer shows Harris, a black man with a criminal record, fleeing deputies who targeted him in an open-air drug market in Tulsa. Bates, a businessman whose close ties to the Tulsa County Sheriff’s Office include donating equipment and managing the sheriff’s election campaign, shot a writhing Harris in the back after mistakenly discharging his gun instead of a Taser. Bates immediately apologized for what he had done, but it was too late for Harris. The tragedy of the 44-year-old Harris’ public execution is that it illustrates one of the little-known consequences of mass incarceration: that his death was the result of policing made sport, and that this sport could be obtained with an entry fee of multiple donations to the Sheriff’s Office. Is this an isolated event or part of a potentially larger, more disturbing trend? Beyond allegations that Bates was unqualified to handle a firearm is the frightening fact that there are at least 400,000 reserve and volunteer police officers in the United States. Are they properly trained? And how do departments weed out those who take their roles seriously, versus those who take this as an opportunity to treat predominantly black and brown neighborhoods as a kind of hunting ground? In this 21st-century safari, the “big game” are young black men, often with criminal records, who were caught in the clutches of the drug war and criminal-justice system at an early age. Harris, like tens of thousands of other black men in America, had a criminal record, so he now suffers a second death at the hands of an unforgiving media gaze that has shown more interest in understanding Bates’ grief than in feeling the Harris family’s pain. Racial terror through the criminal-justice system has reached perverse new lows in America, producing an opportunity for a “Let’s play cops and kill n—gers” tourism industry that allows an apparently unqualified law-enforcement reserve officer to mistakenly kill a black suspect. This tragedy is rooted not only in a disregard for black lives but also in a system that rounds up, arrests and incarcerates black folks at such extraordinary rates that it virtually guarantees that even innocent victims will have criminal records—records that are markers of shame, demonization and inhumanity, since American society firmly believes that criminals, especially black ones, deserve whatever they get. Bates and his legal team have done a masterly job of damage control, embarking on a public relations tour that included an interview on the Today show, where family surrounded him. There, Bates initially described killing Harris as the “second-worst thing” that had ever happened to him (after cancer), before amending that statement and conceding that accidentally shooting this black man was indeed the worst. The tragedy of Eric Harris’ life is that the same criminal-justice system that ensured his premature death will afford his killer—who has been charged with second-degree manslaughter (which carries a maximum sentence of four years)—every opportunity to avoid jail because of race and class privilege. Too often, black men in America are denied justice in life and in death. In a very real sense, the lives of black men who live in the “wrong” zip codes, attend the “wrong” schools and allegedly make the “wrong” personal life choices have now become objects of scorn, derision and state-sanctioned violence. The national sense of moral outrage at the perpetual killing of black men and boys (and our women and girls) at the hands of the police does little to halt what has become a national crisis. One of the latest victims is Baltimore resident Freddie Gray, whose spine was severed and who died one week after being taken into police custody. The latest threat, then, to African Americans is not the “black-on-black crime” that conservative critics rail at but the potential targeting of low-income African-American neighborhoods for sport. In these new killing fields, voyeurs of urban crime can stalk their prey with impunity, armed with Tasers, badges and handguns, and in an adrenaline-fueled instant take another black life, knowing that an apology will be sufficient punishment for a killing that too often is still not considered a crime.